Cabo San Lucas, Mexico (November 2, 2018) – A new Four-Hand Tequila & Nopal Massage is now offered at SE Spa at the AAA Five Diamond Grand Velas Los Cabos. The treatment (80 min; $399 USD) begins with an energy purification ritual to call forth the four elements. Purifying sage symbolizes the earth, a floating candle for fire and water, and a feather that represents the air. Following the pre-treatment ceremony, one spa therapistuses ancestral techniques of stretching using typical Mexican shawl to help release muscle tension while another applies a tequila rub to seal the skin. Native to Mexico, the Blue Agave plant which is harvested to produce tequila has anti-inflammatory and antiseptic properties. At the end of the treatment, a masque made with nopal softens the hands and feet with its high emollient properties. Included in any treatment of 50 minutes or more, a seven step water journey features a eucalyptus-scented steam room with chromotherapy, polar pool, aromatherapy sensory shower, sauna, Jacuzzi and multi-sensory pool. The central pool features several hydro elements such as powerful massaging faucets for neck and back and bubble beds, carved-stone chaises with jets set just underneath the surface of the water on which guests recline. A spa valet provides shots of Tea Forte teas and healthy snacks for additional health benefits as well as personalized direction to make sure guests get the most out of the truly relaxing hydrotherapy experience — such as how to alternate the various hot and cold rooms and pools, and how long to linger in them. Upon completion of the journey, guests recline on heated loungers with warm neck pillows, cool scented towels and cucumbers on the eyes to ensure the body is fully relaxed for a treatment. 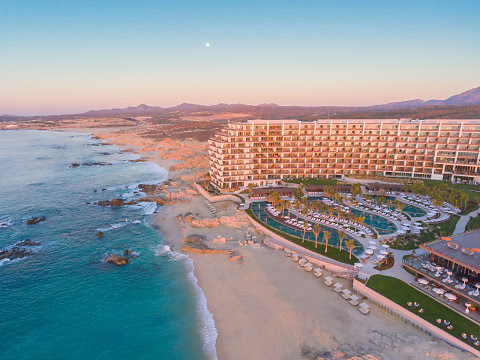 Rates at Grand Velas Los Cabos’ all-inclusive resort start at $582 per person per night in double occupancy. Rate includes luxury suite accommodations, 24-hour in-suite service, gourmet, premium branded beverages, nightly entertainment, taxes, gratuity, and more. For reservations or additional information, please call 1-888-407-4869 or visit https://loscabos.grandvelas.com/.